Beautiful setting. Spacious suite with unique curved ceilings. Welcoming staff. Fabulous breakfast brought directly to your room. The hotel staff was waiting for us. Thats why they want to know when you are arriving. Someone took our luggage right away to our room. 20 minutes from airport. The views are breathtaking. 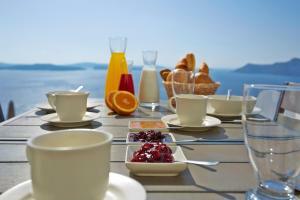 Breakfast is served on your patio at the time you want. A decent choice. We had a 5 pm flight so they were accommodating and ket us stay in our room till 3 as slow season. Great location, impeccable service and absolutely beautiful place .. loved it!! Amazing! Loved everything about this property....the owners, staff, suite, location, the breakfast! A little pricey but everything is in Oia, Santorini. Dream about going back one day!! The staff, rooms, pools, everything was absolutely amazing. Hands down the most beautiful place I’ve ever stayed, the complimentary breakfast is unbelievable. I am so happy I stayed here. Lady’s boss and staff are very friendly and helpful , very good service . Fantastic staff, location is perfect and family-owned which is always a huge plus! Netflix was included surprisingly , the locating is perfect the breakfast is amazing, for our staying it was a little bit pricy about 290€ a night . But it was worth it the view is what you pay for !, the service was extra ordinary. Must visit . Amazing rooms! The view was great and the service provided by the staff was even better. Fantastic view!!! Good rooms and sumptuous breakfast ! Comfortable beds I ever experienced. Staff were extremely friendly. Relaxing retreat!! Lock in a great price for Atrina Canava 1894 – rated 9.7 by recent guests! 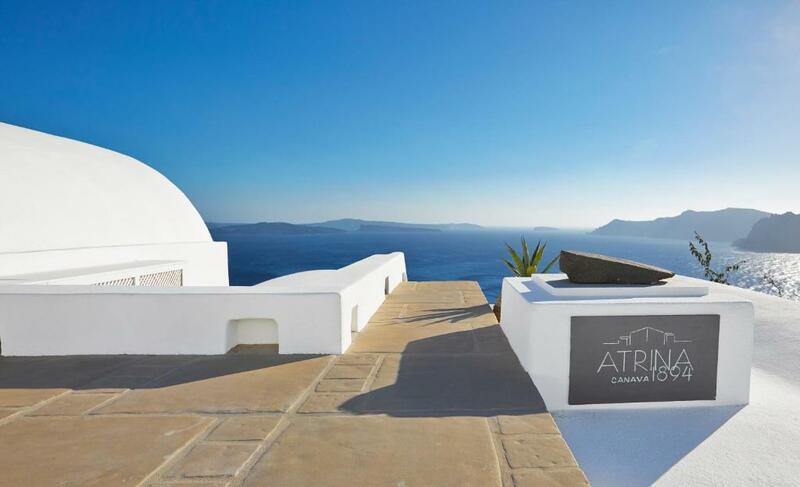 Housed in a former estate of the turn of the century, the Cycladic-style Atrina Canava 1894 is carved into the volcanic rock in the charming village of Oia. 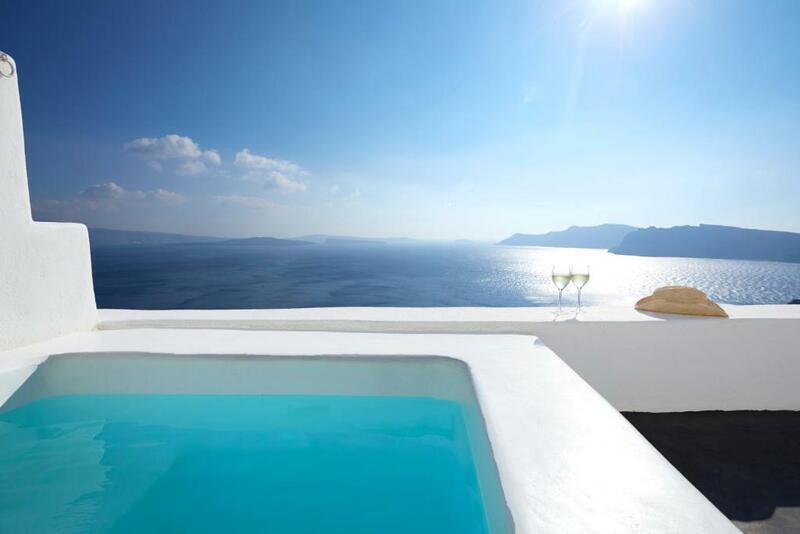 Its stylish, self-catering units enjoy spectacular volcano and sea views. It offers a pool and poolside snack bar. The accommodations types of Atrina follow the simple, yet elegant style of Santorini. They all include a well-equipped kitchenette with dining area and a living area with satellite LCD TV. The private bathroom is stocked with cosmetics, bathrobes and slippers. Guests can enjoy refreshing drinks, coffees and cocktails by the pool, while 24-hour pool bar service is available. 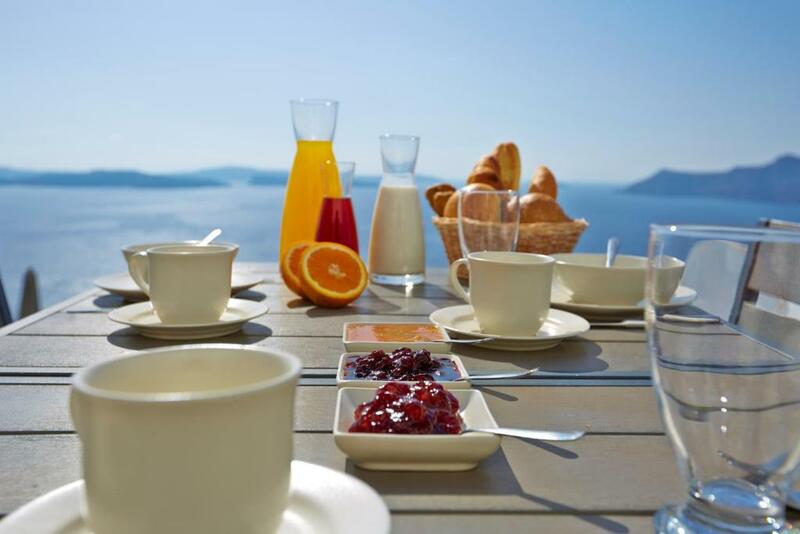 Continental breakfast can be enjoyed in the room. Within walking distance, guests will also find traditional taverns, restaurants and cafes. The lively town of Fira is 7.5 mi away from Atrina Canava 1894. Santorini Airport is 11 mi away and Athinios Port is at 12 mi. Free WiFi is available throughout the property and free parking can be found nearby. When would you like to stay at Atrina Canava 1894? This apartment features a balcony, CD player and electric kettle. This suite has a balcony, kitchenware and soundproofing. This suite features a balcony, kitchenette and air conditioning. Please note that this room type cannot accommodate any children nor extra beds. In the year 1894 our great grandfather owned two caves (in Greek “Canava”) which he used for the first process of making wine, meaning treading grapes. He even carved his signature on the wall of the main cave to be remembered by. As the years went by they passed on to the next generation and the next……We started to rebuild the two caves and eventually created a complex of traditional houses that are built strictly according to the architecture of the island. Today it answers to the name ATRINA CANAVA 1894 traditional houses. Our houses vary in size from 40 to 90 sq.meters. 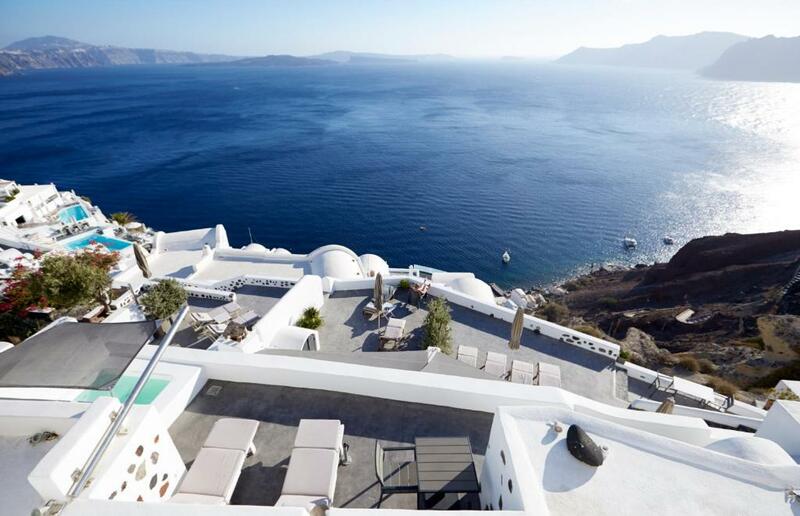 Volcano rocks create the external structure of the houses, giving the pool area a spectacular look and surround the whole compound creating the natural look of Santorini. 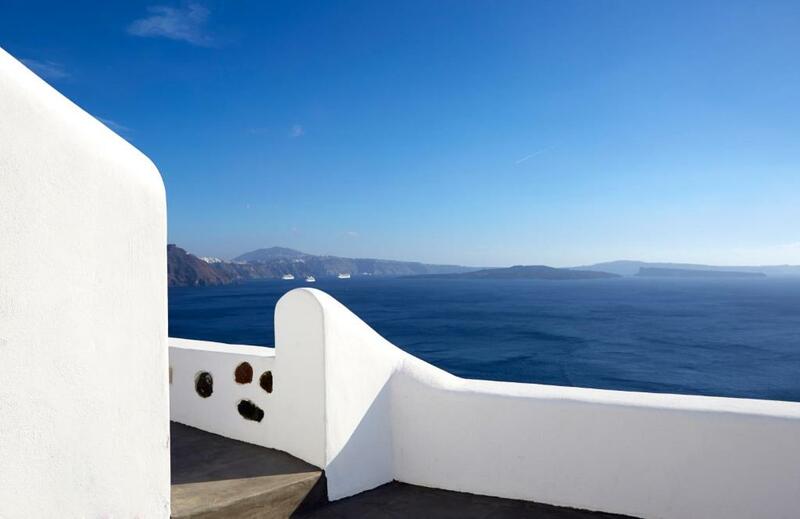 Entering our facility you will find a breathtaking view with the whole island of Santorini lying before you and the stunning volcano gazing at you. House Rules Atrina Canava 1894 takes special requests – add in the next step! Any additional adults are charged EUR 100 per night for extra beds. Atrina Canava 1894 accepts these cards and reserves the right to temporarily hold an amount prior to arrival. Loved it all. Lovely accommodation. Fantastic location. Wonderful views. Great breakfast. We wasnt informed there was a pool. No confectionary/snacks in room however when we asked we where provided with some. No brochure regarding santorini/transport/ things to do. Morning disturbance. Great breakfast however served cold including coffee! Spacious clean rooms. Everything!!! This place is such good value for money! 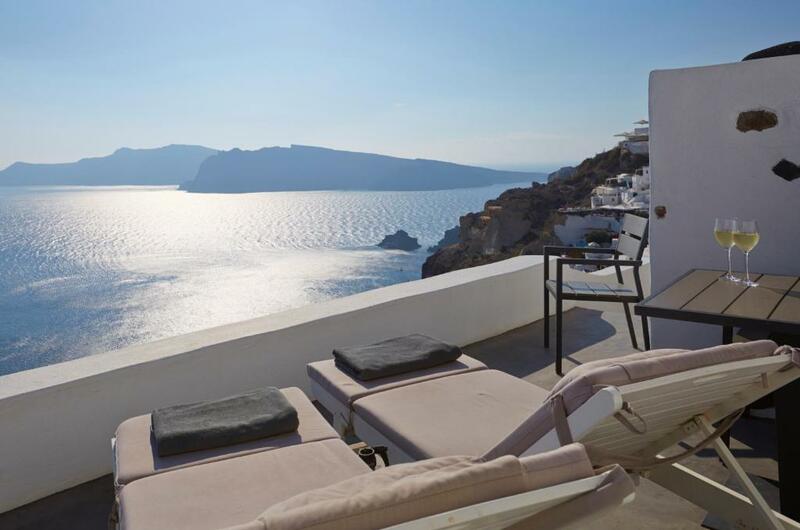 You get the same level of luxury as other places in Oia that charge a lot more! 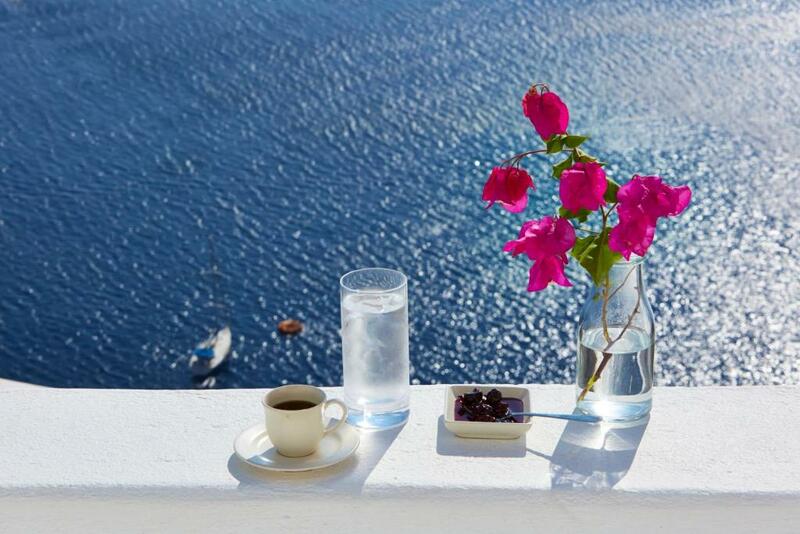 The service, the breakfasts, the privacy and views are second to none! We stayed in Xenonas room which had a private balcony and hot pool and had a traditional cave style architecture with modern decor! We were on our honeymoon and would do it all over again tomorrow if we could!!! The scenery was breathtaking. The service was great. The breakfast was outstanding. The view and the location are unbeatable. The staff are incredibly friendly and happy to help however they can. Would highly recommend. Honestly, other then the somewhat uncooperative weather, our stay was beyond expectations! Excellent in all regards. Thank you for a wonderful time! Lots of house flies descend on the table once the food arrives. No clothes cupboard in 2nd bedroom in the Grand Canava 1894 villa. Master bedroom shower dial was cranky in turning on the hot water. Water pressure was weak. 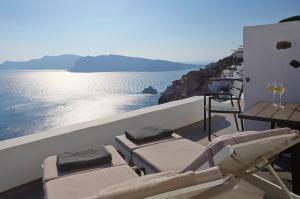 Phenomenal views, in a great location overlooking the caldera. Staff is friendly and helpful. Great breakfast spread, including delicious Greek yoghurt with thyme honey, fruits and/or muesli, choices of egg, and also pancakes. The resident cats are friendly and make themselves very much at home, in our villa. Words can not describe absolutely outstanding in every way. The service, location and pretty much everything as a whole was excellent. If you're like me and reading this review because you just can't decide on where to stay-- then let me save you some time and money, and tell you to book here. I travel leisurely quite frequently, so trust me when I say it's accomodations and service like thiers that make your stay that much more enjoyable. I can guarantee you will love this place. and I will be back for sure.